Walnut caterpillars (Datana integerrima) are native insects meaning that year-to-year population densities are usually kept in check by predators, parasitoids, and pathogens (the 3-Ps). However, we occasionally see "outbreak years" when caterpillar numbers surge ahead of the combined natural suppression provided by the 3-Ps. I'm not suggesting we are experiencing an outbreak season, but walnut caterpillars are certainly not hard to find! In fact, I've come across the characteristic patchy defoliation produced by colonies of these caterpillars on their namesake host in two different locations over the past two days. The caterpillars are general defoliators and feed in groups that may include 10-30 caterpillars. This is why their defoliation is often confined to a single branch or a group of adjoining branches. As their common name implies, walnut caterpillars favor walnut trees, but they will also feed on hickory and pecan trees and will occasionally infest apple, birch, honeylocust, oak, and willow. There are at least two generations per year in Ohio; we are apparently in between generations in the southwest part of the state. Eggs are laid by the moths on the underside of leaves. First instar caterpillars often go unnoticed because of their small size and their feeding behavior; they often confine their feeding to one or two leaflets. Damage becomes more apparent when the caterpillars reach the second instar stage and start stripping all of the leaflets from the compound leaves of walnuts leaving behind the leaf rachis. The caterpillars have the interesting habit of rearing their front and tail ends in unison to ward off offenders. Walnut caterpillars have three color phases meaning that the larvae change color patterns as they mature. Newly hatched caterpillars are reddish to reddish-yellow and they remain this color through the second instar stage. During the third and fourth instar stages, the caterpillars are brick red with faint white stripes. In the final instar stage, the caterpillars are grayish black with long, soft white hairs. Walnut caterpillars practice an unusual molting behavior. When molting, they group together on trunks, branches, or twigs and all of the caterpillars molt at the same time leaving behind a mass of hairy exoskeletons that looks like a patch of fur. Finding these furry patches on or near denuded walnut leaves is good way to identify the culprit behind the defoliation. Walnut caterpillar has two generations per season in Ohio; however, egg hatch may occur over an extended period of time for the second generation meaning that early instars may be present at the same time as late instars. The caterpillars feed for 4 -6 weeks until full grown (about 2" long), then they drop from the trees and pupate in underground cells. Although the damage caused by the caterpillars can be devastating to small trees in landscapes, walnut caterpillars are seldom considered a serious pest in woodlands. 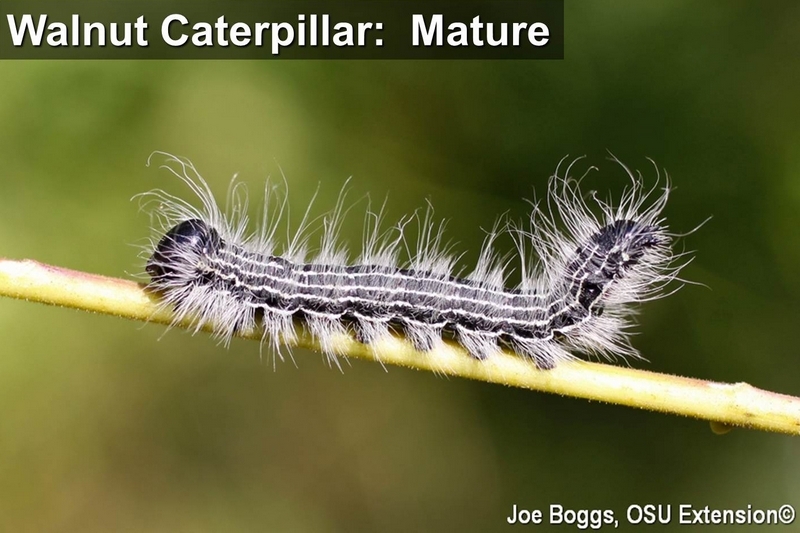 The caterpillars can be easily managed on small landscape trees by knocking them to the ground and performing the "caterpillar stomp dance;" so far, none have become resistant to this control method.